Are you ready for the picnic? The pattern for these comfortable and cute elastic-waist shorts includes contrast trim, mock-wrap styling, and a faux fly. The raglan-sleeve pull-on blouse includes gathers at the yokes, elastic at the shoulders, three-quarter-length sleeves, and wide hems. Share your photos on Instagram with the hashtags #classpicnicblouse and #oliverands. After successfully sewing this pattern, you will have developed the following skills: external facing, gathering, and raglan sleeves. Blouse: Light- to medium-weight woven fabrics like quilting cotton, voile, lawn, shirting, poplin, broadcloth, and linen. Shorts, Main (Fabric A): Light- to medium-weight woven fabrics like quilting cotton, chambray, shirting, poplin, broadcloth, canvas, twill, and linen. Shorts, Facings and Trim (Fabric B): Light- to medium-weight woven fabrics like quilting cotton, voile, lawn, shirting, poplin, broadcloth, and linen. Blouse: Coordinating thread, 1/4" elastic (approximately 10" length for all sizes). Shorts: Coordinating thread, lightweight fusible interfacing, 1/2 yard of 3/4" elastic. Blouse Length* 11" 11 3/4" 12 1/2" 13 1/4" 14" 14 3/4"
Sleeve Length** 8 3/4" 9" 9 1/2" 10" 10 1/4" 10 3/4"
Shorts Inseam 1 3/4" 1 3/4" 1 3/4" 1 3/4" 1 3/4" 2"
Shorts Extended Waist 19 1/2" 20 1/2" 21 1/2" 22 1/2" 23 1/2" 24 1/2"
Blouse Length* 15 1/2" 16 1/4" 17" 17 3/4" 18 1/2" 19 1/4"
Sleeve Length** 11" 11 1/2" 11 3/4" 12 1/4" 12 1/2" 13"
Shorts Inseam 2 1/4" 2 1/2" 2 3/4" 3" 3 1/4" 3 1/2"
Shorts Extended Waist 25 1/4" 26 1/4" 27 1/2" 28 1/2" 30" 31"
I made these shorts as a gift for my niece along with the swingset tunic. What a cute combination for a summer outfit. These shorts are absolutely adorable. They were so easy to make, too. I will definitely be making these again for my own daughter. I made this up in a soft flannel with piping for a simple winter shirt for my grand. It wasn't too hot and looked adorable on her. The perfect length and design for the moderate Houston winter wear. I have made 4 pairs since buying the pattern. My daughter loves them! I love the clear directions and supportive community, where I found a link to modify and add ruffles along the edge. I also felt very professional and accomplished as a semi-new sewer. The finished garment has a very ready made look to it, no one has said oh did you make those! And finally, they don't take that long to make. The shirt was also very well done. Looking forward to making more of both! Due to my success and my daughter's love for her shorts, I have gone on to buy several more patterns and excited to sew cute clothes for my older boys as well. I made this shirt for my daughter' first day of preschool. I wanted something cute (check) that would still be comfortable enough for her to rock the monkey bars (check!). The pattern was easy to follow and very nicely constructed, hiding any rough edges. This was my first Oliver and S pattern, and now I'm hooked. I've made both the top and the shorts, and both are fun and easy to sew. The shorts have nice details that elevate them from ordinary pull-on shorts. I made the size 2 for my 2-year old - the top fits well, but the shorts are a bit snug over diapers. She's on the tall side, so perhaps a size 3 would be better for length (and would last a bit longer too). 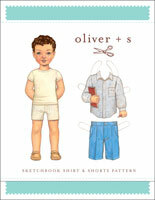 But overall, this is another great pattern from oliver + s.
I had this pattern in paper format in the bigger size originally and had made the shorts. Because they had been so well received, I purchased the digital pattern in the smaller size and made them for my petite 4 year old in size 3. The shorts are roomy but easily fitted thanks to the elastic in the back. I like the length and the wrap around facing give it that extra special touch. 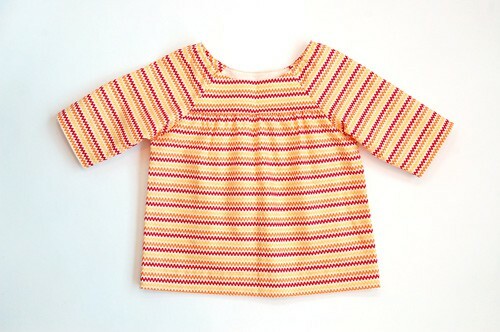 I have also made the top twice in size 3 and find it an easy sew that produces a very cute look. I made this for my 18 month old daughter in a lightweight cotton print. She is on the tall side, so I made the 2T size and it fit a little big, but was plenty adjustable because of the elastic waistband and elastic at the neckline. I enjoyed this project because it was fairly easy to sew, but had some really nice details that made the pieces an upgrade from other kids' sewing patterns. The only minor critique I have is that the PDF seemed like it could have used space more efficiently to print out on fewer pages. Loved sewing this pattern. Made the top in 6-12 month size and used double gauze. It looks beautiful and so feminine yet with the elastic neck it's a breeze to put on and take off! Fast sew too. I added to the blouse and flared it at the bottom and it made an adorable dress! The sleeves seemed plenty big at the bottom so I put elastic in them to keep them from seeming too baggy on my daughters very thin arms...would for sure sew it again! Started it during my kids afternoon naps and was done before supper! I've sewn this set up once and loved it! I even bought the pattern in the larger sizes so I can sew it up again. The blouse is roomy, though, so don't size up. 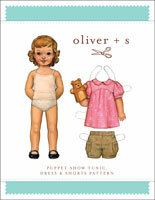 This was the first purchased pattern that I've sewed up from my Oliver+s collection. 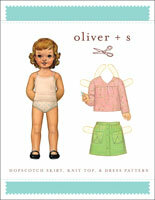 My previous sewing projects from Oliver+s were the Lazy Days Skirt and the Popover dress. I really enjoyed making these shorts for my six year old. She is really slim and the sizing was perfect! The elastic waistband on the back side really helped perfect the fit. There were a lot of pattern pieces for a pair of shorts but that is really what makes them so special and with really nice details. I couldn't find a good pairing of fabrics so I just used one print and it looked great. My only head scratching moment was when I was deciding between my 1/2" elastic and my 3/4". I thought the 3/4" was the better choice but I am certain the instructions say 1/2" (not the list of supplies but the point in the instructions were it says to insert the elastic). It didn't make a big difference but I updated my instructions so I wouldn't forget next time. Overall this is an excellent shorts pattern! This is my favorite pattern for little girl shorts! I've made 4 or 5 pairs in various sizes. The possibilities are endless- contrast bindings, ruffles, etc! The top is quick and easy. The shorts fit snugly over a cloth diaper. This is my favorite pattern. The blouse has the simplicity and the ease of wear of a peasant blouse but the extra details bring it up a notch. Use that small but beautiful piece of fabric you've been saving for the yoke and add some piping to class it up. Lengthen the top to make the perfect nightgown. 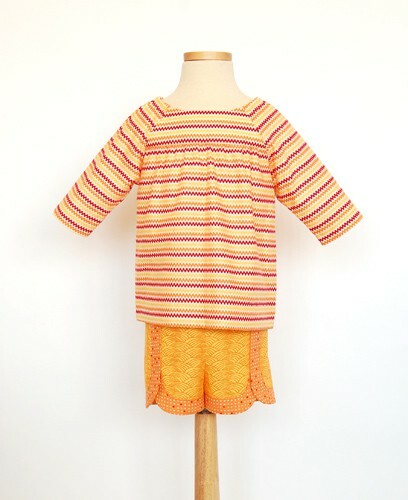 I do love the top but the real star in this set is the shorts pattern. I love the retro shape of these shorts and the contrasting trim is super cool. 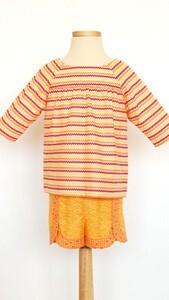 It is fun to let the kids mix and match the prints and guess what, these shorts actually get worn regularly! 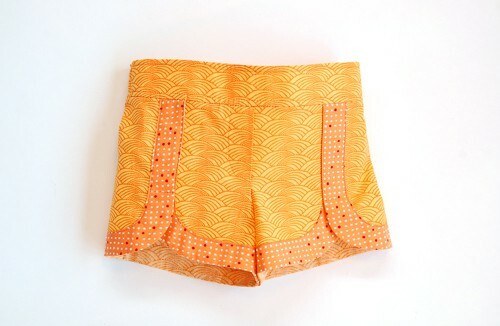 This pattern is so clever I get giddy while making these shorts. I would suggest getting the paper pattern. While I typically like O+S digital patterns, because of all of curves in the trim and the body of the shorts, it is confusing as to what pages to print for what size and a lot of paper is wasted. So far I have made three pairs of the shorts and two blouses (one with knit). The pattern is adorable and of course easy to follow. Both the shorts and the blouse come together quickly and I love how you can customize the trim on the shorts. I've done the trim as called for in the pattern, used a 1" bias tape and am thinking I will make a pair of the shorts trimmed with lace. Best of all, the shorts are not too short! Thank you for another great pattern. Just finished my first Class Picnic blouse. This was fun and easy to make. I can see lots of possibilities for using contrasting fabrics for the yoke or sleeves as well as adding trim between the yoke and body. I loved this pattern. The sleeves were a little narrow for my 3 yr old GD. I also thought they would be longer. I will use this pattern again and again. Thanks so much. Discussion on the digital class picnic blouse + shorts sewing pattern from the Oliver + S Discussion Forums. Find and share more photos on Instagram using the hashtags #classpicnicblouse and #oliverands.